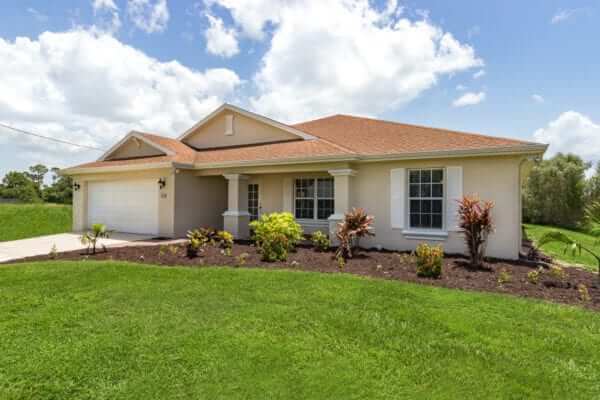 1815 NW 38th Ave, Cape Coral – $459,000… Furnished/Turnkey – EVERYTHING INCLUDED! Gorgeous FURNISHED/TURNKEY Waterfront GULF ACCESS home with TILE ROOF! This POOL home with SPA shows like a model home! Built by Villa Homes there is no detail gone unnoticed. Stunning open floor plan makes this home light and bright. GREAT ROOM with High Ceilings and beautiful view out to the pool. The kitchen any Chef would love offers: GRANITE, upgraded cabinets, long seating island, and more. Dining area offers: Frameless windows with beautiful views of pool and canal. Huge Master bedroom offers: seating area, tray ceiling, two walk-in closets and private entry to pool/spa area. Magnificent Master bath with: HUGE WALK–THROUGH SHOWER and inviting soaking tub. Guest room offers en-suite bath for the upmost privacy. Surround sound system. WHOLE HOUSE r/o water system. Salt filtrated Pool System. Composite DOCK w/LIFT. Upgraded storm protection. OVERSIZED PAVER Pool Deck. Lush Landscaping with gorgeous Palm Trees. Boating access to the Gulf of Mexico, beaches, & surrounding islands such as Cayo Costa, Cabbage Key, Sanibel, Boca Grand & more… Championship Golf Courses just a short ride away. Easy access to Fort Myers Int’l Airport only about 30 miles away. 4108 NW 35th St, Cape Coral – $274,900… POOL HOME! Q3 is in full swing bringing with it a most expected decrease in sales for July. 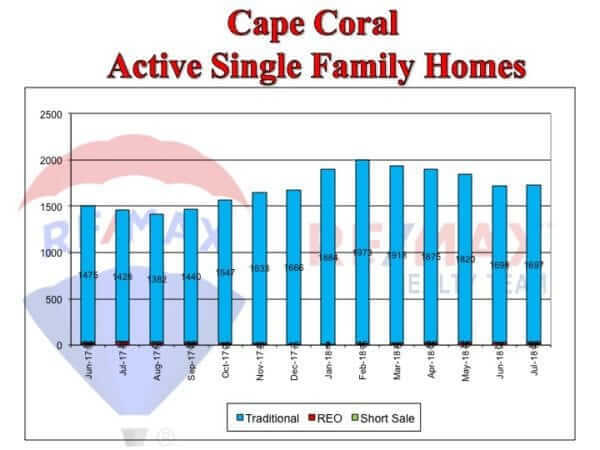 Cape Coral sales totaled 411 last month a drop from 474 in June. 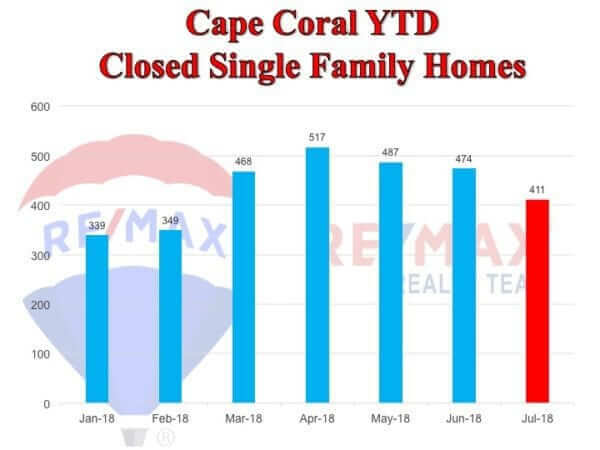 Another anticipated trend is the uptick in new inventory for this time of year, although 2018 has witnessed an unprecedented number of new active homes and inventory, levels creeped up to those of a neutral market. Sales prices remain at sustainable levels with a rise of nearly 7%. July home prices were $284,000 up from last year’s $266,000. 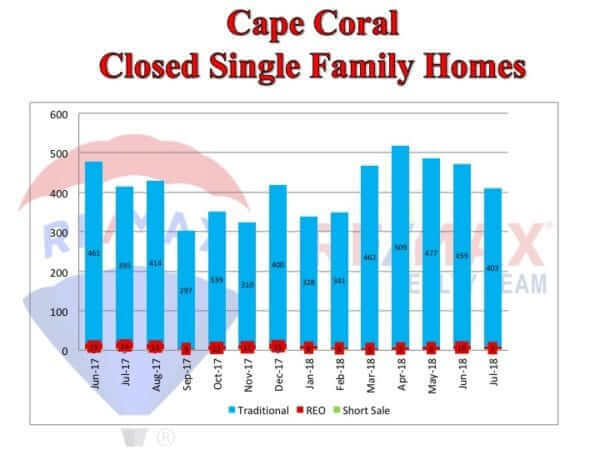 Inventory has risen in the past year, and of the available listings 57% are priced over $251,000. By comparison, entry levels home make up 39% of the supply. Another rate increase is highly probable as early as September, although rates are still historically low, a rise of 1% diminishes buying power by roughly $30k. Wage growth has risen 2.6% (annualized), many potential buyers are waiting until earnings and home prices are better aligned.